A quick explanation for my blogging absence. A major spring-cleaning and house purge that went longer than you can imagine, a unexpected dart-in-the-neck type of allergy response triggered by a late but pollen-laden spring that practically put me into a coma I swear, a bit of outdoor nesting as you will read about below. Sometimes that happens and once started I was determined to get overdue tasks out of the way before Daisy and I head up to Haliburton in Northern Ontario for July to spend time with my best friend at her most relaxing cottage. Plenty of girl time, hiking, rowing, swimming, campfires, and s'mores and absolutely no schedule, quite possibly no makeup either. I hope to blog but that will be based on their internet provider in this secluded setting. In the meantime, I still have several weeks to pass along some gift wrapping ideas of a more summery look. 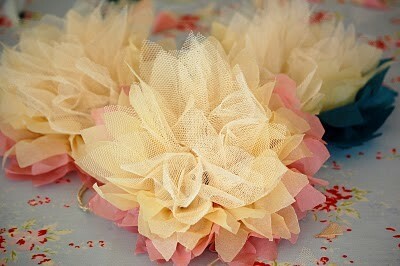 As I have claimed many times, I am not a crafty gal but even I can make these tulle and tissue pom poms. I think the combination of the soft and stiff materials gives the pom pom a bit more layered personality. I will try a few, some really big ones and show you how to use them for a soft and summery gift presentation. You can get started with this easy tutorial here. Last winter I was watching the movie Sisters, kind of a depressing movie (based on the Anton Chekhov play) about a dysfunctional trio of sisters. When the movie opens, they are preparing a birthday party and as they are trading verbal barbs, one of them is hanging a most colourful garland of glowing birthday lights across a balcony staircase. I know it was the satin ribbon and brightly coloured bags that caught my eye and and I made a mental note to find the festive party enhancer, truthfully it was the only thing that made that movie rental worthwhile. To make a long story shorter, I finally ran across it this morning and the Martha Stewart tutorial can be seen here. Imagine the colour possibilities! 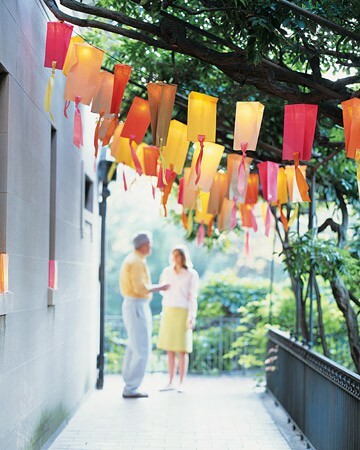 I love them used outdoors (if the evening stays dry) but loved them equally as used in the movie, indoors to brighten up a wintry birthday celebration. Our screened veranda is finally finished and it has become one of those "why didn't we do this sooner" type of home projects, we do feel like we suddenly have a small cottage outside our living room. I believe in spending every minute of our relatively short summer season outdoors and to enjoy meals without swatting flies away has become an indulgent pleasure each and every evening. I have always loved screened porches and mostly because they strike me as quite cosy in the evening so the first thing I did was go buy lamps. To turn on an outdoor lamp in our area without attracting mosquitoes is quite the summer luxury, of course they still come but they can't get to us now. I have quickly progressed from nighttime reading to watching itune movies on my laptop which as led to the final decision in finishing our new living quarters which I knew would answer itself pretty quickly. 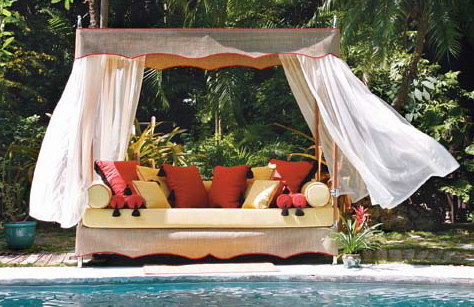 I am so going to need a daybed..............function always follows form. Speaking of itunes movies...............and speaking of steamy! Leaving is a tortured and passionate love story, the kind that Kristin Scott Thomas does so well. There are sub-titles, a beautiful locale, no happy ending, plenty of steamy behavior, and a big question............how far would you go for love? Note: I do watch all kinds of movies, fun ones too. Image 1 via Greedy For Colour/Image 2 via Martha Stewart/Image 3 and 4 via Google/ Links above.